Next time you go to grab a can of Diet Coke from the store, you may have a tough time recognizing it. That's because the incredibly popular diet soda has been fully rebranded in an effort to appeal to the younger crowd (aka millennials), and will now be sold in slimmer, more colorful 12-ounce cans and come in four brand new fruity flavors. On Wednesday, Coca-Cola announced that the president's favorite beverage, which first hit shelves in 1982, has undergone what it's calling a "full brand restage," which involves new sleeker packaging and the introduction of four new Diet Coke flavors: Ginger Lime, Feisty Cherry, Zesty Blood Orange, and Twisted Mango. However, there's no reason for diehard DC fans to freak out that they're beloved bubbly drink is changing because the one-and-only classic Diet Coke is not being formulated in any way -- it'll just look a little different. The new look and flavors are the result of a two-year process during which the Diet Coke research and development team tested more than 30 new flavor combos, eventually settling on the four listed above. They also slimmed down the iconic 12-ounce can to give it a "more contemporary feel," according to a press release. Another distinguishing feature on the new cans is a fresh stripe of color from top to bottom, which Coca-Cola's VP of Global Design James Sommerville has dubbed the "High Line." “It visualizes how the Diet Coke brand, the innovation -- and the consumers who love Diet Coke -- are continually on the move, with confidence," he said, per the release. Of course, the big question is why did Diet Coke decide it needed to change things up? Well, for one, sales have been down in recent years as younger folks have flocked to other calorie-free carbonated options like LaCroix. And as Coca-Cola North America's group director for Diet Coke, Rafael Acevedo, explained in an interview with Buzzfeed News, it had to appeal to a changing demographic. "We love the essence of Diet Coke and we don’t want to throw it away -- just modernize it so we can re-express it for a new generation of fans," he said. He even went on to liken the change to when the James Bond franchise freshened up its formula for a new generation by casting the "rougher, more personable" Daniel Craig as the titular character. 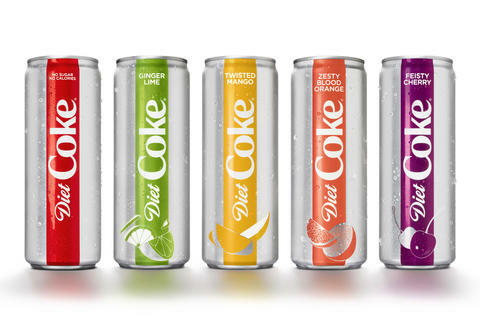 Starting later this month, Diet Coke and the new flavors will be available in the new slim 12-ounce cans, and will be sold individually and as eight-packs. Traditional Diet Coke will continue to be offered in all existing package sizes (e.g., standard 12-ounce cans, mini cans, glass bottles, etc. ), and if you're worried that these new flavors are replacing the existing Diet Coke Cherry and Diet Coke Lime varieties, fret not. Those two will still be available, though only via Amazon.